I was honored to be asked to present on the school-to-prison pipeline at the Washington state 1st Legislative District. I thought I’d share my talk with you. I’ve been working with incarcerated folks for 14 years and with youth in particular for 9 years. In the first year that I was at King County Juvenile Detention, I was playing cards – Spades – with youth during their free time. One of the young men was getting out the next day. I asked him, what is the first thing you are going to do when you leave? The normal answer to that is, “I’m going to gramma’s to get some good food.” Or possibly McDonalds, Ezell’s or some other food related activity. But on this day, the young man didn’t say that. He told me, in raw vulnerability, that he just wanted to go home to a normal family. His mother was a drug addict and his dad was a gang member. He thought if he went home, he would end up using drugs and be dead by the age of 21. That broke my heart. Here was a youth that was brought to the point of hopelessness. He did the work of self-examination and transformation while in detention but did not have the community to return to that would support his change. I made a promise on that day that I would continue to work on transforming the community that youth return to so that they can succeed with newly changed lives. An even better plan was if they never reached me at all. Because the school-to-prison pipeline force is strong. I actually call it the cradle-to-prison pipeline because the seeds are sewn in access to pre-K education, healthcare, and economic opportunity for the families and guardians of our youth. But the schools and school policy can and do impact the pipeline. And the list goes on of harsher treatment for those who are not white. For example, In decline hearings, which is when the courts “decline” to treat you as a youth and treat you as an adult, black youth are declined at higher rates, in King County, for the same offenses, than white youth. At every choice opportunity in the system from preschool through the court system, youth of color are treated harsher. But we can interrupt that. In detention, when I started, my counterpart in the Roman Catholic world was Joe Cotton. We would chat often, and still do. We knew there had to be a better way than the way our kids were currently being processed. Joe left to do youth work and I stayed. I would occasionally go into the Director’s office and say, “Hey, how about restorative justice?” And the response was not very fruitful. I nearly fell off my chair. I grabbed the sign-up paper and ran back to my desk and filled it out. That was when I knew that serious change was coming to detention and to the status quo. I went to the training and learned of a method called Peacemaking Circles. Peacemaking Circles come to us from Tagish and Tlingit First nation people of the Yukon territory via my teacher, Saroeum Phoung. Not only did I take the training, but I signed up to help in whatever way I could. The first thing that happened was participating in a pilot program that deferred a youth from the traditional, punitive justice system to the peacemaking circle process. But change was not only coming to the youth and the actual court process, it was being implemented at every level in detention. The prosecutors office, the detention staff, the court staff…each were coming together to bring this process to themselves before they brought it to the youth. For you see, to teach peace, you must know peace. We have now created the King County Peacemaking Coordinating Team or PCT. The PCT has taken four pilot cases and I’m going to share two of the cases that have been fully adjudicated with you. “Okay, I’ll be right back,” Rimon told her. Fifteen minutes later, he returned, and the two drove to the dental office, located in the building where Rimon’s family used to live in New Holly Park. Outside the dental office, there were SWAT teams in the parking lot and surrounding the building. Nura’s cell phone rang and a man identified himself to her as a detective with the Seattle PD. “Are you related to Rimon?” the man asked. “He is my son,” Nura said. You see,when Rimon had left the house for 15 minutes, he and a friend went to a nearby park to buy Nike tennis shoes from another teen. Instead of purchasing the shoes, Rimon pulled out a gun and threatened to shoot the boy. He and his friend then took off with two pairs of shoes. Rimon slipped upstairs and hid the gun and shoes in his room before leaving for his dental appointment. The gun was actually a BB gun, but real gun or air gun, he had threatened someone’s life in the midst of a robbery. Even with no prior convictions, Rimon could spend a minimum of 103 weeks (2 years) in a juvenile detention center for his crime under state sentencing guidelines. But the Senior Deputy Prosecutor, Jimmy Hung, had another idea. Jimmy had been participating in Peacemaking Circles with Saroeum Phoung and decided the time was ripe to introduce this restorative process. Jimmy called Saroeum and the path was laid. I came into it about halfway through the process and I circled with Nura, Rimon’s mother. People think that it is the easy way out, but it really is not. This is sitting in a circle with community, with the victim or a victim advocate, confessing your failings and asking for accountability from those who are present. In this process the victim must consent for someone to participate. Saroeum says this, “People hear about Peacemaking Circles, and they think it sounds like all this ‘kum ba yah’ stuff,” but it is not easy to heal yourself, heal the community, and to heal the victim. Again and again, Rimon owned up to his mistake and apologized for it. As he started to understand the magnitude of what he had done, he followed the knowledge with action. He wrote a letter of apology to the victim. When his mother was notified that they would have to move out of their apartment because of his crime, Rimon wrote a letter to the housing authority asking for forgiveness and another chance. Rimon’s life has been changed and another black man will not be a forgotten statistic. 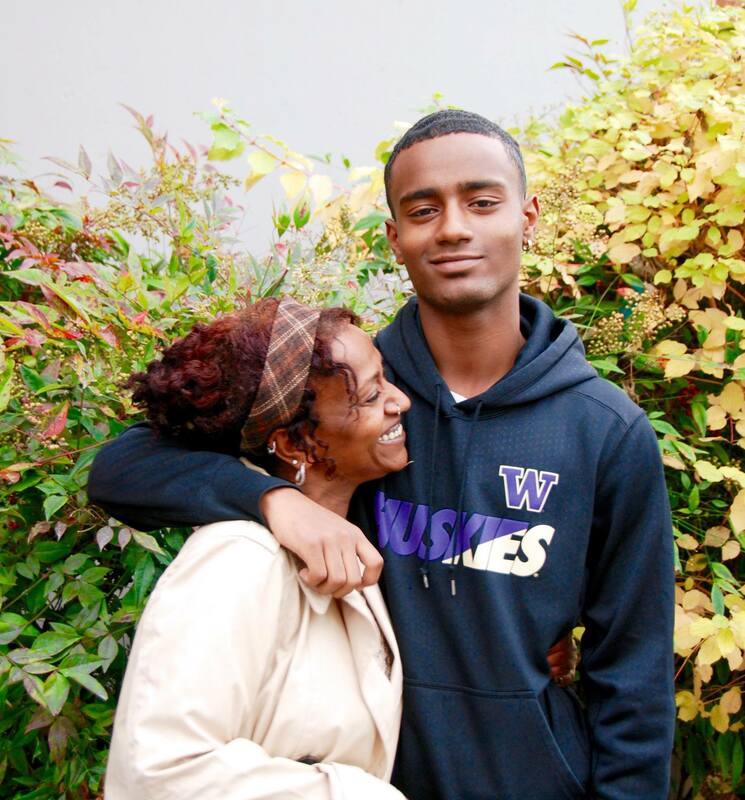 Since his final adjudication in October 2016, Rimon has graduated high school, been accepted into college, and completed an internship with the King County Executive’s office. This month, all the charges against Rimon will be removed from his record. Vinnie’s case is our second pilot case that has completed adjudication. Vinnie’s case starts in school. Vinnie was at a low point in his life. His parents were divorcing and his community was falling apart. He became a bully and he had a target. In the bullying process, the following elements took place: threatening texts, a picture texted of Vinnie holding a gun, many words crossed, and the final straw, a shoving match on school grounds. The victim had told no one about the bullying that was happening. But the moment something went down on school grounds, the veil was pulled back for us all to see the pain that was caused. Unfortunately, this met the level of felony harassment which means a credible threat of life. But again, Prosecutor Jimmy Hung stepped up and asked us to take the case during our pilot period. Even though we were totally maxed out with two other cases going. Those of us on the PCT are all volunteering our time. We met with Vinnie and his family. We met with the victim and his family. The victim and his mother were unwaivering in their request for Vinnie to participate in this restorative process. Vinnie and his family had a long ways to go towards healing themselves before they could meet with the victim. But they showed up in a big way to process the wounding that led to Vinnie’s crime. Teachers, friends, cousins…they all turned up. This goes to the heart of what it means to circle together. Community coming together to transform brokenness to beauty. Eventually, Vinnie and the family were healthy enough to circle with the victim’s community. It turns out that the victim and his family were going through a similar divorce and shattering of the family community. Layer in felony harassment and you have a truly traumatic moment in their lives that has irreparably changed their lives. In the end, at the sentencing circle, a circle of community members and the justice system held in the basement of a church in Capital Hill on a Saturday mind you…including the judge, the prosecutor, and the defense attorneys…including the victim’s community…including Vinnie’s community…and including the King County Peacemaking Coordinating Team…perhaps the most profound words came from Judge Roger Rogoff. You see, peacemaking circles are not just for the healing of the offender and victim, healing comes to everyone present. During the Peacemaking Circle process, Vinnie started going to community college. He has now graduated and is an Assistant Manager at Zumiez. He dreams of being a clothing designer. I’ve been reading bell hooks “All About Love” and am mightily persuaded that we need to have a love ethic. Love ethics seeks the growth and betterment of self and others. I am also persuaded that Peacemaking Circles help us find our way towards that and help youth that are on the edge by building a community of compassion around them. Even in families and homes we think of “as normal” there may be a compassion deficit that causes youth to experience pain that may stop them from living into their full potential. The community can become the witness to their story and their eventual healing. We have two current pilot cases that we are still working with in addition to another pilot program called the Young Warrior’s Project. Briefly, the other two cases are trickier. They are co-defendants and involve undocumented families. Without the community and faith communities opening their buildings and declaring their space safe sanctuary, we are mindful that the very worst thing could happen. The shattering of the family. And even here, the schools are involved. While sitting in circle with the youth, I and one of my colleagues noticed that communication seemed particularly hard for one of the young men. I asked him about school and learning, and he told me it was very hard for him. And since I’m part of his community now, we went to the school. There was no IEP and they were literally putting him in front of a computer screen to catch his learning up. Well, this was frustrating to him because he couldn’t read well enough to learn this way. We asked the school to test him and they discovered that this 16 year old was reading at a 3rd grade level. That changed things for him. But I wonder what would have happened to this young person if someone had noticed this before we became his makeshift community. The young warriors project is 12 low-level felony youth that are circling right now as we speak in the Kent area. It is a diversion program from the traditional justice system. Leading this circle is Saroeum who I spoke of earlier, Vinnie, and Rimon. It takes community participation, a willingness to trust the process, and imaginations that are bigger than the small systems we each participate in. It also takes lives lived with a peacemaking and love ethic because to teach peace, you must know peace. To teach love, you must know love. Our next steps are to transform our pilot projects into permanent projects. We plan to kick-off the fulness of the King County PCT complete with court and community referrals on January 26 at the First Annual Celebration of Peace. This will be held at Seattle University. I hope all of you will be there. Because that is one way you blow up the cradle to prison pipeline.